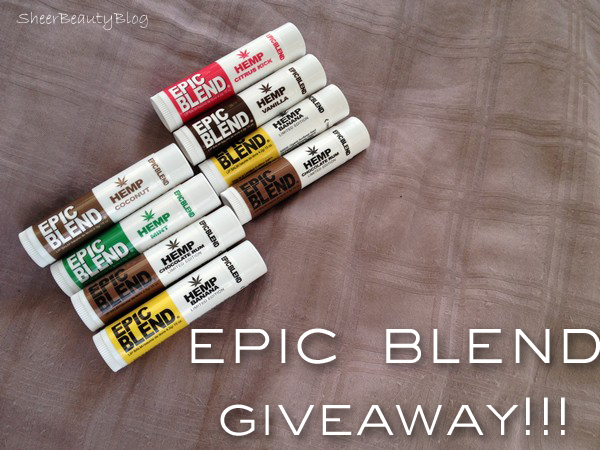 Blogoversary is in a few days and to celebrate I'm giving away lip balms provided by Epic Blend. I have been using Epic Blend lip balms since late November to condition my lips when I'm at home. These lip balms smell so good! Epic Blend come in 3 types of lip balm hemp, more moisture and vegan. They apply on smooth and don't leave your lips feeling greasy. Hemp is organic hemp seed oil which is a great anti-oxidant, it's nourishing and quickly absorbs into your lips. More moisture has seven moisturizers with a boost of staying power. Last vegan is 100% plant based and beeswax free lip balm.Epic Blend is also gluten free, Non GMO, all natural and not tested on animals. Also if you choose to follow me on any social media site this includes new followers to Sheer Beauty Blog please kindly do not unfollow or unlike once giveaway is over, I will make note of it and band people who are doing so, thanks you. the coconut hemp lip balm looks awesome! i love lip balms - green apple sounds yum! I want to try green apple. I want to try them all but if I need to choose one: the Chocolate Rum!! !